Mom’s passionate about archaeology. Dad likes to birdwatch. Grandmom wants to score a new table runner and iPad cover. The kids want to see crocodiles, go whitewater rafting–oh, and swim with sharks. Sound like an impossible vacation to plan? If you’re heading to Central America, it won’t be as hard as you think. The region is jam-packed with ancient history, diverse cultures, incredible wildlife, and endless opportunities to dabble in adventure. Here, we’ve compiled eleven different types of activities in Guatemala, Belize, and Honduras to help you create a travel itinerary that will keep whole the family happy. There’s something here for everyone. We’ve even included sharks. San Juan La Laguna and Santiago Atitlán are two indigenous towns located on Lake Atitlán in Guatemala’s highland region. 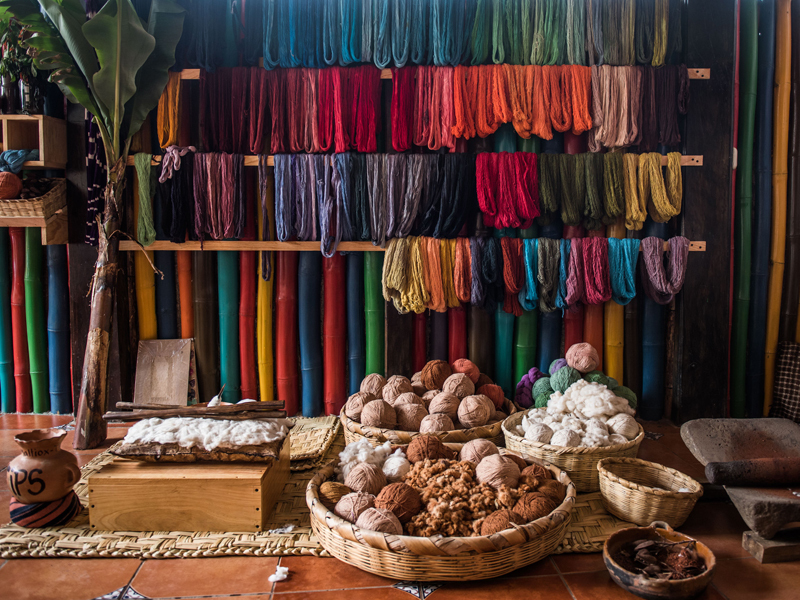 At the former, you can learn how all-natural dyes like beets and carrots and traditional backstrap weaving methods are used to make some of Guatemala’s prettiest textiles (think scarves, tablecloths, and even iPad and Kindle covers). At the latter, you can hunt down the creepy-cool Maya folk saint, Maxímon, who is represented by an effigy that resides in a different member’s house of the local religious brotherhood each year; shamans (spiritual leaders) often perform rituals wherever Maxímon lives. Guatemala may not be the first place that comes to mind when you think of Easter, but it should be. During Semana Santa—or Holy Week, the seven days leading up to Easter—the colonial city becomes a backdrop for daily religious processions during which hundreds of people dressed in robes carry heavy platforms depicting Jesus and Mary through the city. 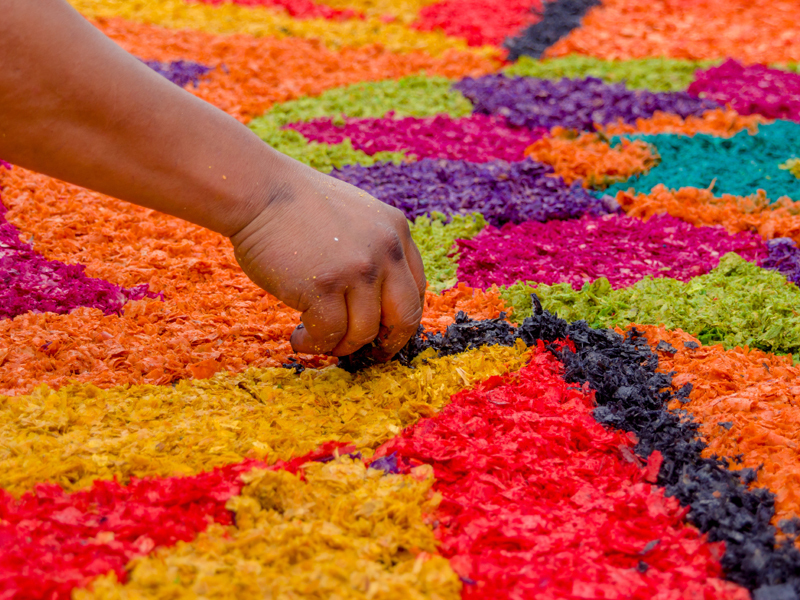 Cobblestone streets are blanketed in elaborate “carpets” made of sawdust, flowers, and pine needles. It’s an incredibly fascinating and well-organized holiday, and many consider Semana Santa the city of Antigua’s finest moment. The southern district of Toledo is Belize’s cultural hub and home to a medley of Maya and Garífuna communities with their own food, music, crafts, and traditions. Visit towns like San Pedro Columbia, Santa Ana, and Barranco, and you’ll have the opportunity to prepare corn tortillas from scratch, see how traditional Maya instruments are made, listen to the Afro-Caribbean beats of local Garífuna drummers, and learn how chocolate is made (cacao is an important part of the Maya culture). Located in northern Honduras, Pico Bonito National Park is the start of the riotous Río Cangrejal, a jungle-lined river that offers some of Central America’s finest whitewater rafting and kayaking. It’s the perfect spot for both novices and skilled river-runners alike, as the rapids range from Class II to Class V. Newbies can focus on basic boating skills while exploring appropriate stretches of water; experienced adventurers can tackle more daunting rapids. The water is warm, so wet suits are not required. September through March are usually the best months to visit. One of Guatemala’s signature sights, Lake Atitlán is not only renowned for its beauty, it’s also a great spot for outdoor exploration. Head to the Reserva Natural Atitlán for jungle-lined nature trails, a 23-meter (75-foot) high waterfall, a butterfly preserve, and a series of incredible zip-line routes. You can also explore the lake by kayak and bike, visit ancient Maya caves, or plan a trek up San Pedro volcano for an incredible bird’s-eye-view of the area. Located in the foothills of Belize’s Maya Mountains, Actun Tunichil Muknal (ATM for short) is a five-kilometer-long (three-mile) cave that was once considered by the ancient Maya to be the entrance to the underworld. Just getting to ATM is an adventure and entails a jungle trek, river crossings, and a quick dip in a deep pool. Once inside the cave, you’ll walk, climb, and twist your way through a dark expanse adorned with shimmering stalactites and stalagmites before entering a massive chamber replete with ancient Maya artifacts. 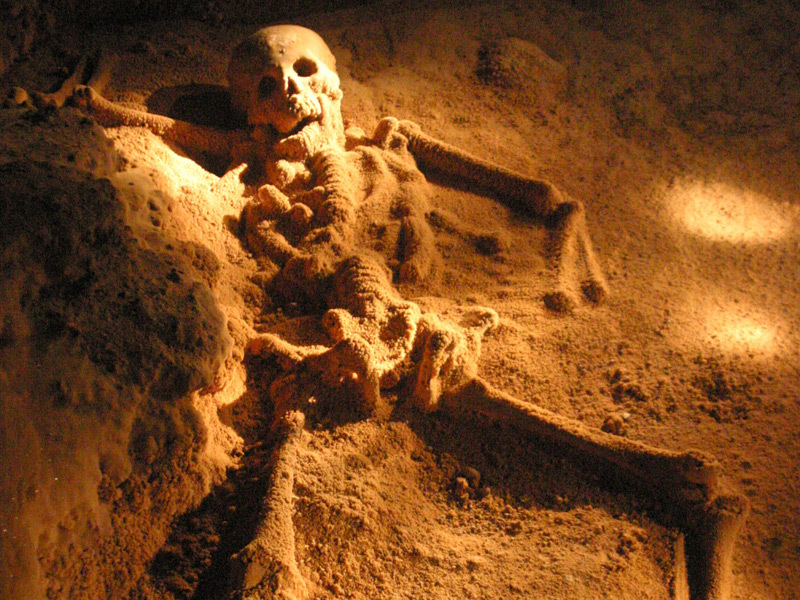 Many people visit Guatemala’s Maya ruins. Few can say they’ve actually spent the night at one. Located in the department of El Petén, not far from Tikal, Uaxactún was one of the longest-occupied cities of the Maya people and can serve as the site for your next camping trip. In addition to “comfortable” camping among the temples with tents, beds, showers, toilets, sunset drinks, and dinner by candlelight, you’ll have the opportunity to learn about the ruins (they once served as an astronomical observatory) and explore the local community, which is home to myriad chicleros (harvesters of natural gum). 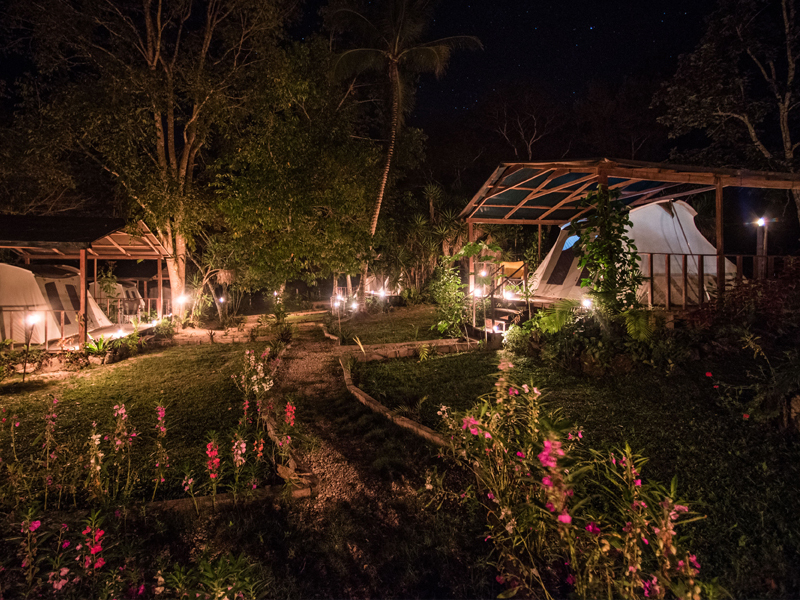 Located on the jungle-lined banks of the New River lagoon, next to the famous Lamanai archaeology site in Belize, Lamanai Outpost Lodge is accessed by speedboat and offers myriad ways to experience the incredible tropical forest around it. 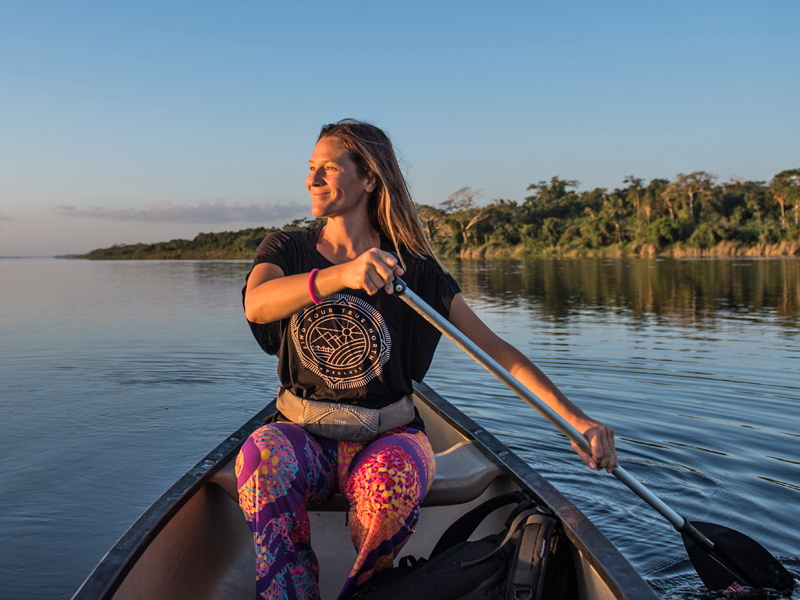 Begin your day in a canoe looking for manatees and otters or end it on a comfortable pontoon boat searching for nocturnal creatures like tree frogs, tarantulas, and scorpions. There are guided tours for birders and trips to surrounding flood plains during which you can observe—and even assist—naturalists from the Lamanai Field Research Center as they collect data on Morelet’s crocodiles. Located on the Bay Island of Roatán, off Honduras’s Caribbean coast, Anthony’s Key Resort offers guests and non-guests alike the opportunity to get to know an Atlantic Bottlenose dolphin. The experience begins with a brief orientation, after which you’ll wade into the crystal-clear, waist-deep waters of the Caribbean where a trained naturalist will give you a personal introduction to a resident dolphin. You’ll learn about the marine mammal’s unique characteristics, anatomy, and behavior and also have the opportunity to touch, kiss, and play with your new acquaintance. Just a 10-minute boat ride from the town of Flores in Guatemala’s department of El Petén (not far from the Tikal ruins), ARCAS Wildlife Rescue Center saves animals captured illegally by people before rehabilitating and returning them to the wild. One of the largest animal rescue centers in the world, it receives between 300 and 600 animals each year. While at ARCAS, you’ll learn more about the organization’s work, animal trafficking, and the animals it saves, while also exploring the center’s interpretive trails and checking out the animals that live permanently at the center. Looking to get up close and personal with a stingray or shark? Hol Chan Marine Reserve in Belize provides the opportunity for just that. Located on the southern tip of Ambergris Caye, this 17-square-kilometer (6.5-square-mile) reserve is home to the famous Shark Ray Alley, an area of sea grass that provides natural habitat for nurse sharks and southern stingrays, alongside of which snorkelers can swim. The reserve also comprises a narrow channel that cuts through a shallow but rich coral reef that’s home to incredible sea life, including moray eels and black groupers.